For market insights many investors focus on the “historical/backward” looking news but fail to realize other exceptionally powerful forces that are also at work; such as “Seasonal Trends”. We believe there is some validity to paying attention to the News events that can impact ones investments; however seasonal factors may provide a simpler and more reliable market insight. When we look at the red line in the above chart we can see that the price of silver usually performs strongly from about November to April. Around this time of year we typically see the price of silver pushing higher and higher with relatively small corrections. In this gold chart we can see a similar result to silver. 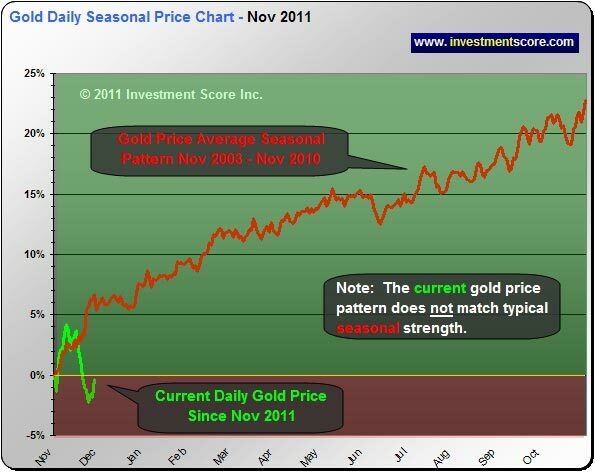 In the typically strong month of November we are seeing gold price performance that is “weak” instead of “strong”. This summer (not shown in the chart above) when one would expect the price of gold to correct, it remained very strong and it really didn’t have any kind of a “pull back” until September. 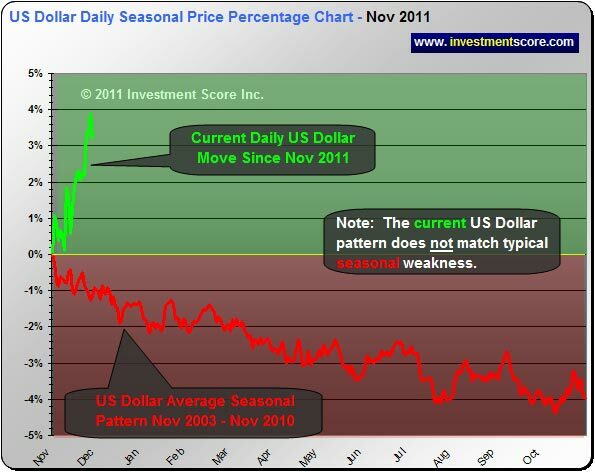 Here we see the US Dollar illustrating unusual price strength instead of typical seasonal weakness. Because precious metals and other markets are “priced” in US dollars, when the US dollar heads up, the” price” of the asset it is measuring tends to fall. So what does all of this mean? To be clear we are extremely bullish on the price of silver and gold in the big picture. We believe that both silver and gold will eventually advance into a full fledged bubble market that will surpass most investor’s wildest dreams. However, in the short term unusual market action is usually a “warning sign” more than it is a “green light” to load up on new positions. Although we believe seasonal trends are a very powerful force and the metals may very well be higher in February than they are here in November, the unusual price action does raise the caution flags that perhaps something a little different is brewing this year. It has been a long time since silver, gold and commodities in general have had a very meaningful correction. There are a lot of warning signs in the markets these days and at this time it may make sense to proceed with caution. Ultimately we expect to make our largest profits from the huge macro moves in the markets. 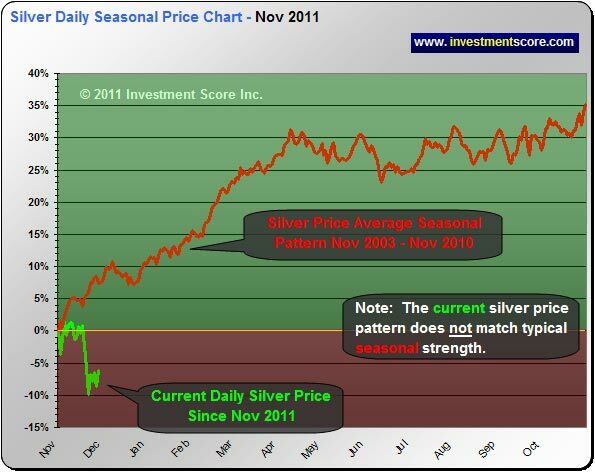 At investmentscore.com we try to identify long term macro trends such as the current silver bull market, identify intermediate term entry points and watch for our ultimate exit point. We not only want to identify and profit from the coming bubble market, we also want to keep our profits for the next low risk opportunity. To read more free commentaries or to sign up for our free or paid newsletter please visit us a www.investmentscore.com.